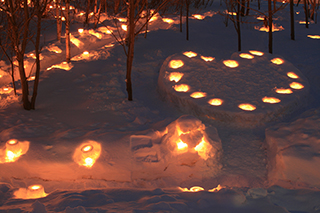 Enjoy the festivities during Hokkaido’s winter season! Since Hokkaido is the northernmost part of Japan, you will experience a lot of snow and cold temperatures if you spend your winter holidays there between January and March. Even if you don’t enjoy partaking in snow sports, you can experience the various snow and ice winter festivities that Hokkaido is famous for. These festivals attract millions of tourists from around the world, so you definitely shouldn’t miss out on them since they’re free to enjoy! The most famous attraction is the Sapporo Snow Festival, which is usually held in February at three sites: Odori Park, Tsudome and Susukino. 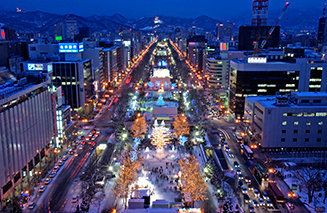 Odori Park is the main site of the festival as it exhibits the famous large snow sculptures – there are around 12 of these, all of which can be as massive as a bus, or even bigger! In addition, there are about 100 smaller statues. The park also hosts concerts and events that use the sculptures in their stage performances. 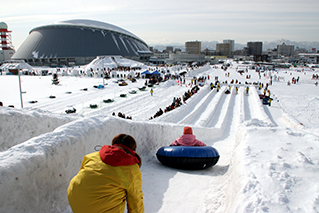 Tsudome (open from January 31) is perfect for the family – this site includes three types of snow slides, snow rafting, more snow sculptures, food stands and a stage for events. 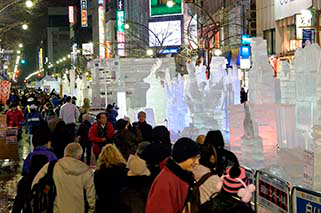 The last site, Susukino, is Sapporo’s largest entertainment district which displays around 100 ice sculptures. These three sites are located nearby each other, so it’s easy to get to all of them. Chitose hosts the annual Hyoutou Festival, which is held from late January until mid-February. The entire lake site, which takes 2 months to prepare, is like an artwork of ice that you can walk through, featuring exhibits like the enchanting green moss tunnel that’s lined with glistening icicles, gigantic natural ice sculptures, and an icy blue tunnel that is the Welcome Gate. While photogenic during the day, by night the multi-coloured lights create a mystical atmosphere, when festival goers can enjoy a variety of activities like fireworks, ice skating, taiko drumming, as well as concerts. 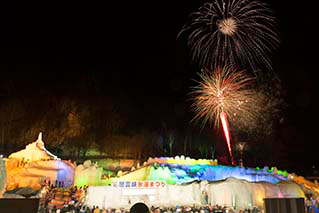 Sounkyo, located to the north of Sapporo, hosts an annual Ice Fall Festival which takes place between late January and mid-March. 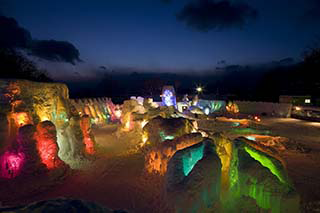 In addition to beautiful ice sculptures, it has an ice shrine where you can make offerings or pray for fortune; for some action, slip down the ice slides (¥500 per 15 minutes) or partake in ice climbing (¥3,500) if you dare! 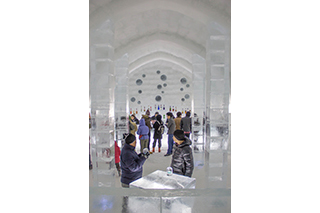 There’s also a Northern Ice Bar where you can sample some sake from Kamikawa Taisetsu (a local Hokkaido brewery), in addition to various stage events like raffles, mochi catching, ice weddings, taiko drum performances and traditional Ainu dances that are unique to Hokkaido. After all the festivities, collect your “extreme cold certificate”, available at the photo area at the entrance. 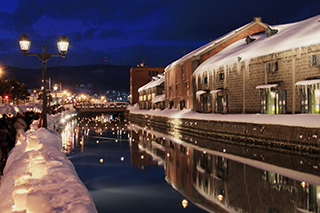 The Otaru Snow Light Path, held during the first half of February, is perfect for photography lovers because it contains displays that you won’t see in any other snow festival in Hokkaido. Its main attraction is the canal site, which features around 100,000 candles that are dotted across the frozen water in glass floats; this romantic sight is amplified by more candles lighting up the tiny snow niches carved along the canal path walls. This festival also covers the former Temiya Railway Line site and the Asarigawa hot spring village, both also beautifully illuminated with candles. 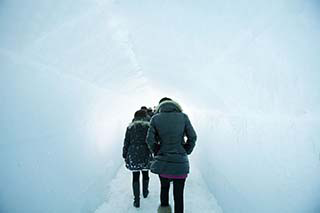 What makes the Otaru Snow Light Path special is the effort that is put into making this festival come alive – many overseas volunteers come to help the locals prepare for the festival. Lake Shikaribetsuko Kotan is the highest lake in Hokkaido (at 810m above sea level) and Japan’s only ice village that you can visit from January to March. In the winter, the lake freezes over and creates the basis for the festival. 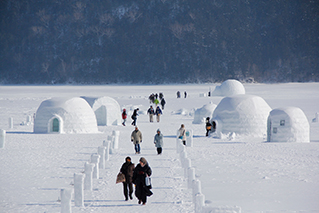 The village consists of igloo houses equipped with seats and ice beds where you can actually spend the night (from ¥2,600), in addition to an open-air onsen, an ice bar and an even ice chapel that you can visit. Other activities include live music, ice sculpting, snow sports and nature walks. If you travel to Hokkaido during the winter season, don’t miss out on these snow and ice festivals. 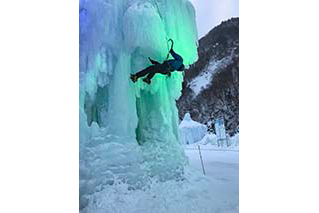 By admiring the intricate ice sculptures, enjoying the live music, or partaking in fun activities like sliding down ice or ice climbing, you will truly immerse yourself in the Hokkaido winter.